You’d think that after visiting the UNESCO-listed fortified churches of Transylvania and the painted churches of Moldavia, also UNESCO listed, we’d have gotten tired of visiting historic churches. Romania has yet another collection of UNESCO-listed churches, though. (Maybe Romania’s motto should be “Land of Churches”!) 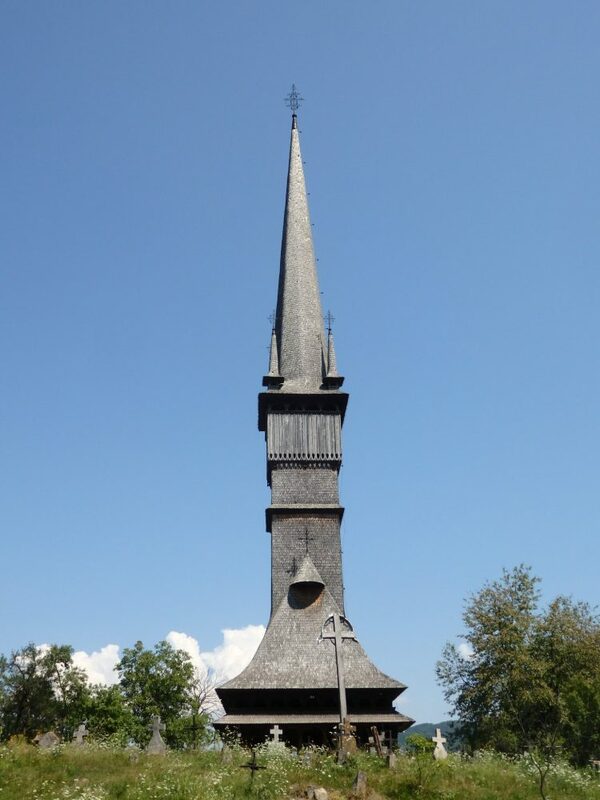 Right up near the border with the Ukraine, the wooden churches of Maramures are unique because of their architecture. Built of wood, these churches sport unusually tall, graceful spires. While their height seems disproportionately tall, the end result is particularly elegant, with touches like prettily overlapping shingles, or small decorative turrets. They don’t all date to the same time period, or even the same century, ranging from the 14th to the 18th. What unites them is the architectural style. Seeing the churches close up, it was their bases that surprised me. While the steeples looked positively delicate, they rest on absolutely massive slabs of wood, forming the very simple rectangular base. Picture a railroad tie: the sort that you might use to edge garden plots. Now put another down next to it, and then lie two more on top of them. That will give you an idea of the sheer size of the oak beams, piled like Lincoln logs, that were used to build these church walls. We were even more surprised when we entered the first of the five wooden churches that we visited, Ieud. Frescoes covered the inside – walls and ceiling. 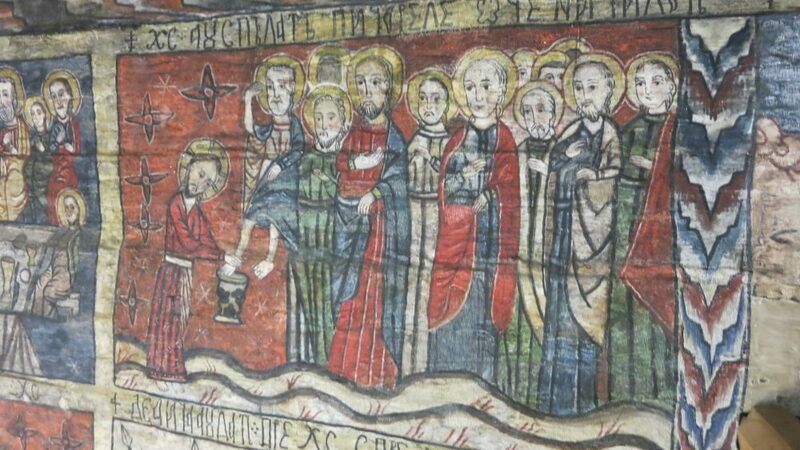 While the themes, like those at the painted churches of Moldavia, were the same – Bible stories – the style was different. The Moldavian churches showed a colorful, detailed, and fairly accomplished style. 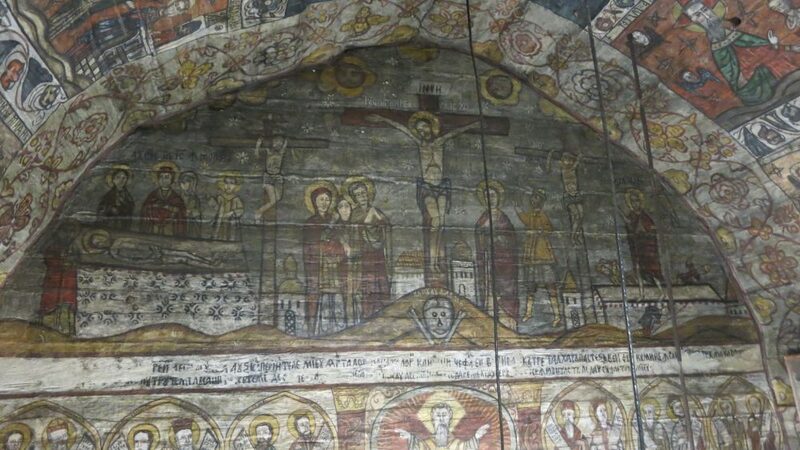 These Maramures churches sport paintings that would fall under the category “folk art.” In other words, the artists were less accomplished, but still managed to portray the Bible stories in a clear and colorful way: necessary in rural areas where, in centuries past, few would be able to read the Bible itself. 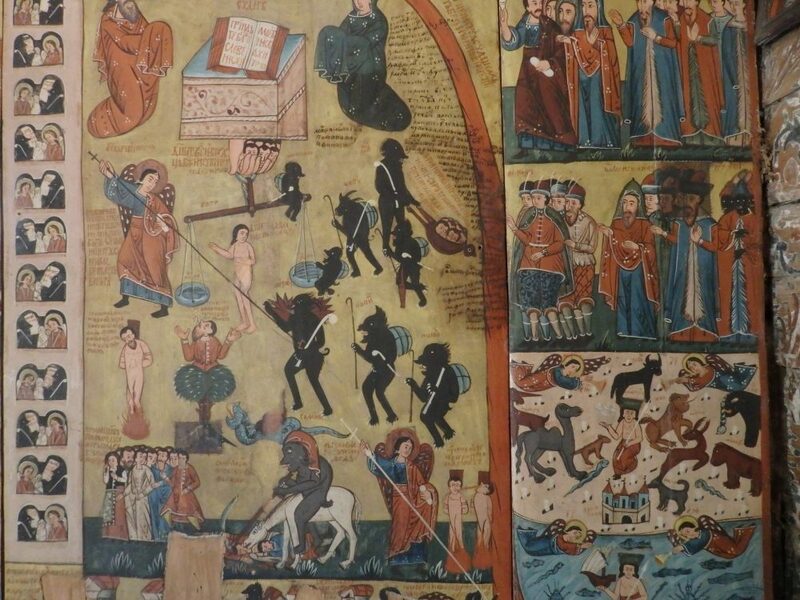 This fresco depicting the Day of Judgment in Budesti’s church doesn’t leave much to the imagination. Each church is divided in two parts. You enter into what serves as the women’s section: the back of the church. Filled with benches, the ceiling is low and painted and accommodates a balcony above. The ladder up is carved from oak, in some cases one single piece. Interior windows without glass separate the women’s section from the main part of the church, where the men sit during services. This main part has a much higher ceiling. We only visited five of the eight churches in the collection, and the photos in this post will give you an impression of what you’ll see if you visit. Each one won’t take more than a half hour of your time, but keep in mind that the roads in that part of the country can be quite rough. Above the altar inside of Desesti’s church is a depiction of the crucifixion. These churches are very much off the beaten tourist path, and you might have to wait to be let in. We especially enjoyed the first church we visited, Ieud. It was closed, but we’d already learned, at other thinly-visited sites, that we just needed to find the sign with the phone numbers, make a call, and someone would come open the door for us. We called the first number posted on the door, and a phone rang very nearby. My first thought was that the person we were calling must be right around the corner of the building. We soon realized that the sound was coming from the edge of the cemetery just a couple of meters away. We found the phone on the ground, plugged into an outlet on a short pole, like what you’d see in a campground. A scrap of carpet covered it. Jesus washes the disciples’ feet in this fresco in Desesti church. We entertained ourselves by wandering around the cemetery, taking pictures. While some of the graves had simple headstones, others had what looked like handmade wooden crosses, often with an odd metal roof over them. I particularly liked the hand-painted depictions of Jesus on the cross, some of which tended toward overweight. 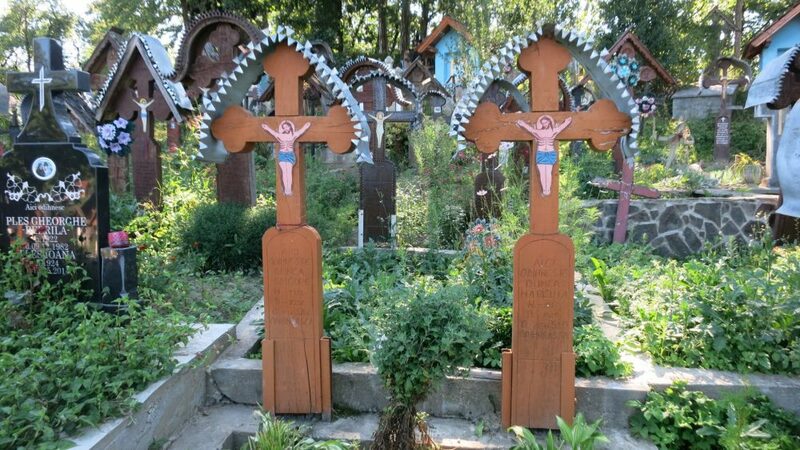 graves in Ieud cemetery, with simply painted crucifixes and metal roofs. Ten minutes later, we heard the sound of a horse clopping up the cobblestone road approaching the church. It was pulling a wagon, carrying the owner of the phone, who climbed down, picked up his phone, and unlocked the door for us. When the gatekeeper arrives by horse and wagon, you know you’ve found a special place! Details: There are eight UNESCO churches that make up one listing: Barsana, Budesti, Desesti, Ieud, Plopis (Sisesti), Poienile Izei, Rogoz (Targu-Lapus), and Surdesti (Sisesti). Each church will charge you an admission fee of the equivalent of a euro or two, and possibly also a photography fee. There are dozens more churches in the region of the same type. The UNESCO listing is here. A perfect picture for pinning! 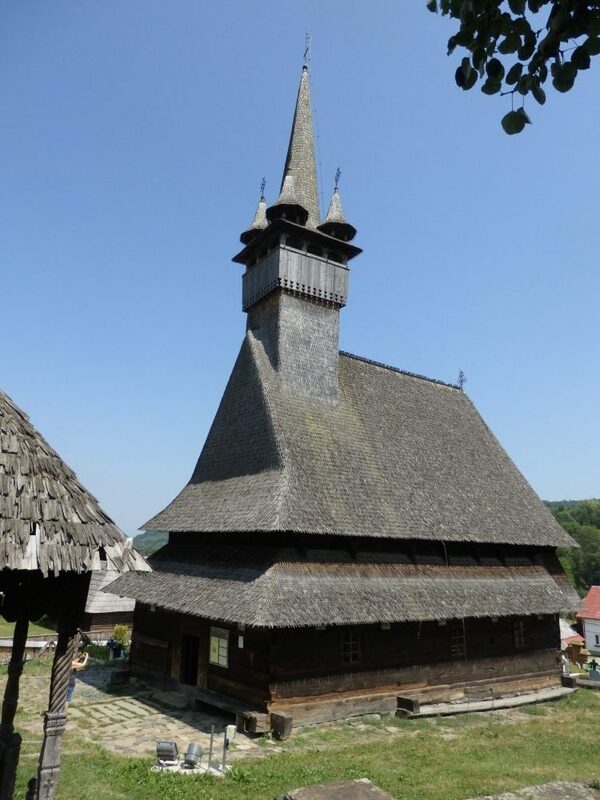 Thx for this great post about the wooden churches of Maramures, Rachel. I’ve not yet been to Romania, but your posts have taught me a lot. We have a few painted churches here in England, but they are always made of stone rather than wood. For some reason I find the wooden churches more interesting – I saw one or two when I was in Poland. The wooden churches of Maramure certainly are unique. I’ve not heard of them before. Very interesting. I’d enjoy visiting them. Sorry it too so long to respond to this; it landed in my spam! Every time, when they picked up, I said something like “I would like to see the church.” I have no idea if they understood, but just hearing me speak English would probably be enough for them to know what it’s for. They’d say just “Ten minutes,” and hang up. Pinned! I really love Romania (except maybe the driving party) and was thrilled to see these and the fortified churches, too. Must return for the Moldavia experience. Yes, you should! Beautiful paintings! More sophisticated than the ones at Maramures. These are amazing! I had no idea they existed. Must add Romania to my list. Oh I love these wonderful old historic churches and could never get tired of them. Thanks for another temptation. . .the bucket list continues to grow! Haha! I know what you mean! We visited 3 sets of UNESCO-listed churches on this trip, plus random other churches and synagogues as we went. Religion is so central to culture and history that, even though I’m not religious, I love to visit places of worship! 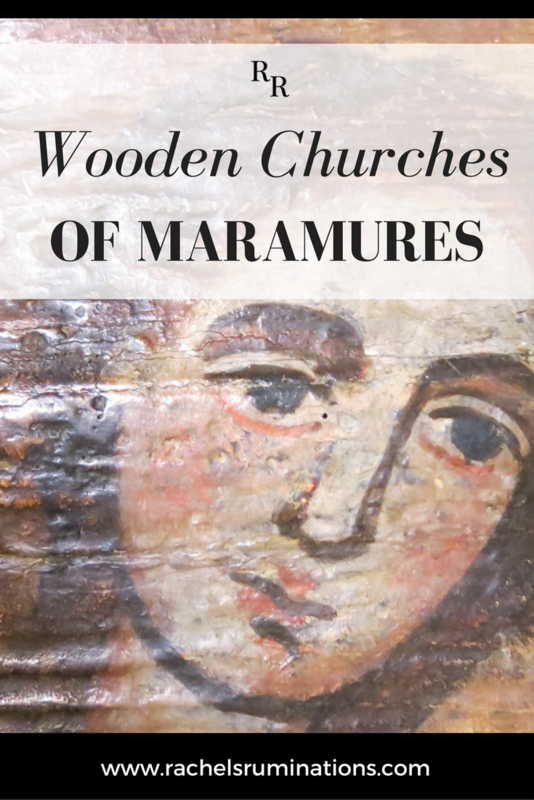 Cool pictures and information about the wooden churches of Maremures. Did you drive the rough roads? Or someone guide you? I would love to rent a car to explore Romania and wonder if I should. Yes, we drove our own car from home. The roads are quite rough in Maramures in particular, since they seem to be upgrading them and adding a highway, but they’re working on all of it at the same time. So, for example, they’ve cut the pavement to add culverts, and not repaved over them yet. So you have to slow down often for those spots, and anywhere else they’re working. It’s doable in an ordinary car like ours, but not quickly. So as long as you’re not in a rush, it’s no problem.